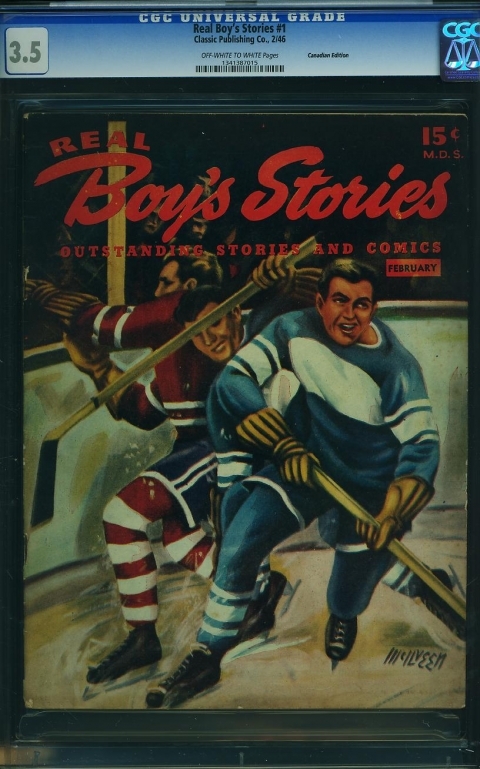 An issue of Real Boy’s Stories No. 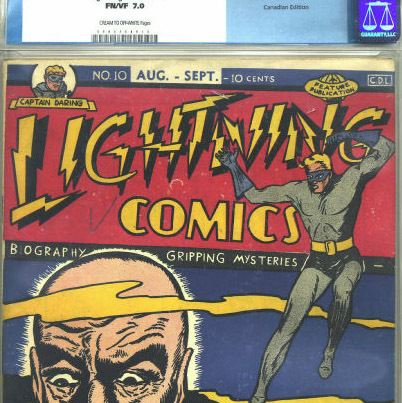 1 has shown up on the coming ComicLink July Focused Auction. I originally wrote about this title four and a half years ago in one of my earliest columns. 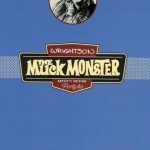 At that time, it was a mystery and Jim Brigham noted in the first comment to the column that that the publisher of this item was Classic Publishing Company a subdivision of Toronto’s Gilberton Publishing which was the first non-American branch of the U.S. company that put out Classics Comics. In fact, this is just around the time that the company put out 6 Canadian editions of that Classics Comics series in Canada. This is the first copy of Real Boy’s Stories that has surfaced to my knowledge. 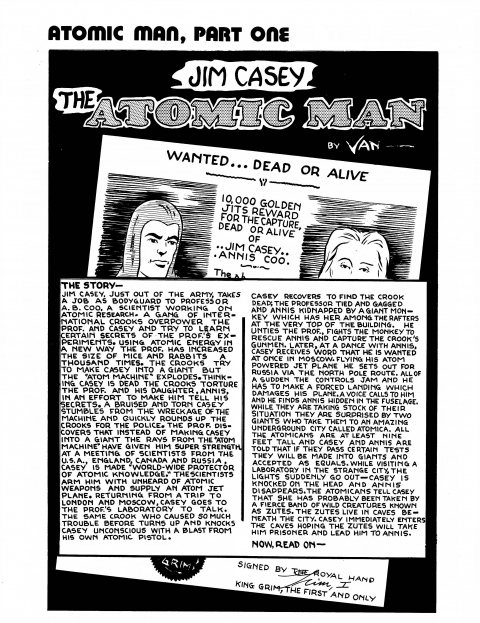 The possibility of the existence of the issue was called up by the appearance of a 15-page story titled “Jim Casey – The Atomic Man” that was serialized over a half-dozen issues of John Balgé and Dave Sim’s Kitchener-based fanzine called Comic Art News & Reviews (CANAR) which started in September 1972. The source material for this reprinting seems to have been the original art for the story that was made available to CANAR by Capt. George Henderson and his vast Whizzbang organization. 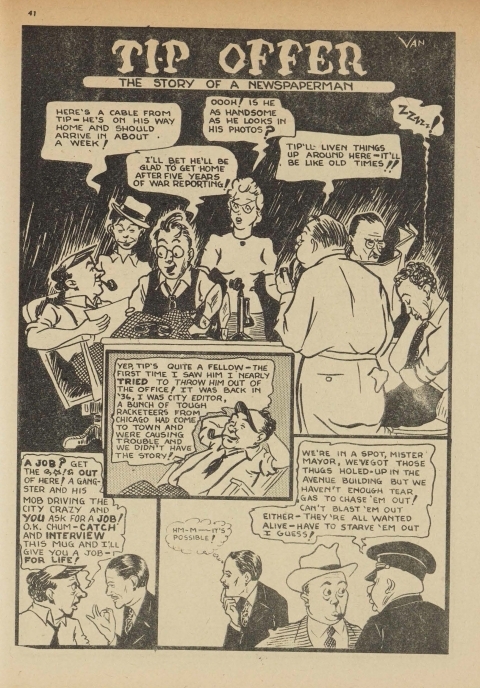 The artist for the story used the pseudonym “VAN” and the same pseudonym appears on the splash page for a story titled “Tip Offer – The Story of a Newspaperman” in Joke Comics No. 25. It’s a pseudonym that hasn’t yet been cracked. Tip Offer by Van from Joke Comics 25. Lastly, for curiosity’s sake, here is an original drawing I found up in Ottawa in one of the boxes at the Library and Archives of Canada. 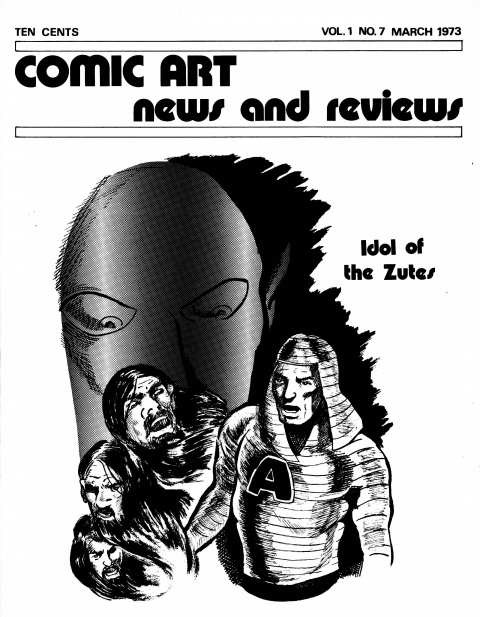 It is probably a Dave Sim take on the character that was never used or very possible an original by Van, who knows? In all probability, the issue on auction contains this story that was reprinted in CANAR. Now, Jim Finlay brought up a point to me that needs to be considered. Is this, in actual fact, a pulp? That is, is this book mainly text stories with a few accompanying illustrations and a small comics section? 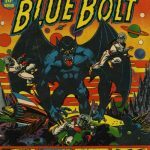 The Victory pulp that ComicLink offered about a year ago had a CGC label that didn’t indicate that it was a pulp and maybe this is the same case here. 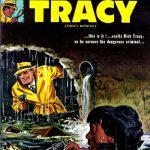 The style of painted cover appears on many pulps but never, to my knowledge, on a WECA comic. The 15-cent price tag is perhaps more appropriate for a pulp and appeared on only a handful of WECA comics (the first 8 issues of Better Comics, the first 8 issues of Wow Comics and the 6 Bell Compendiums from the summer of 1945 for some examples), so this may be a pulp with some comics stories in it as well. The subtitle of the book “Outstanding Stories and Comics” may also point to this. 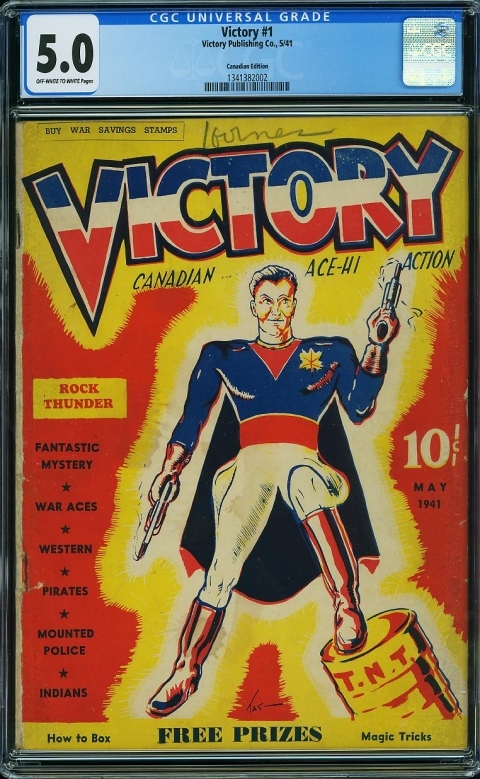 We also know that the cover price of the six Classics Comics that Gilberton published in Canada in 1946 was 15 cents so maybe this was a standard Gilberton price for a comic and Classic Publishing Company being a subsidiary of Gilberton might have used their standard pricing. I hope whoever wins the book will crack it open so that we can find out one way or the other. 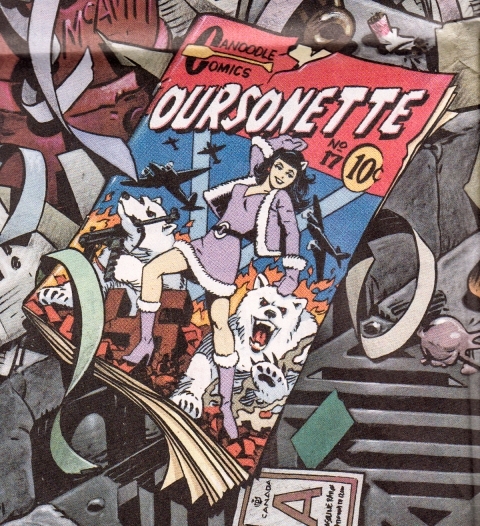 On Saturday, Hamilton cartoonist Dave Collier alerted me to the fact that Canada Day’s Globe and Mail contained a Margaret Atwood short story set in the world of WW II Canadian Comic book artists titled “Oursonette” (Bear Girl). 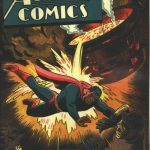 The story happens on VE Day 1945 and concerns a comic book company headed by a female publisher and the company’s main product is Oursonette Comics about a female hero taking on the Axis. Ken Steacy’s main graphic for Margaret Atwood’s story. Oursonette has the power to transform into a polar bear at will and has two polar bear companions that fight along side her. 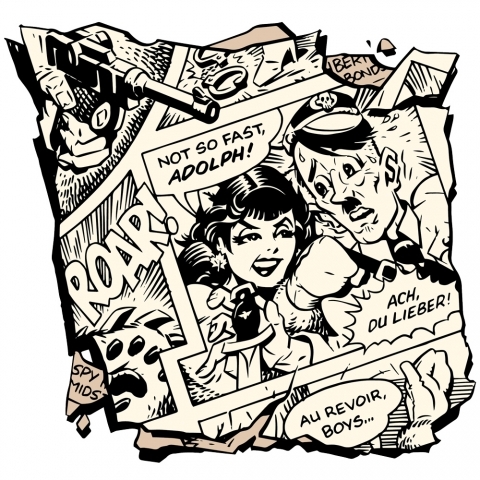 The upshot of the story is that the female who heads the publishing company tells her artists (who are male) that they better be able to draw washing machines and soap powder boxes rather than super heroes and Nazis now that the war is over. A Ken Steacy spot graphic that only appears in the online version. If you missed the hard copy the story is online here . Try to get the hard copy because the illustration done for it by Ken Steacy is great. Atwood seems to have a soft spot for comics and especially Canadian comics. She picked Loubert and Hirsh’s 1971 book the Great Canadian Comic Books as one of her three favourite books of 1971 in an article for the Financial Post that appeared on December 11, 1971. 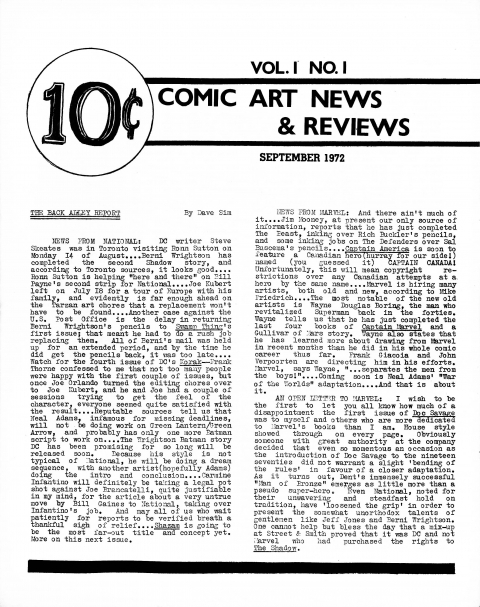 Also check out Bryan K. Munn’s column from October of 2011 for more on Margaret Atwood and comics. 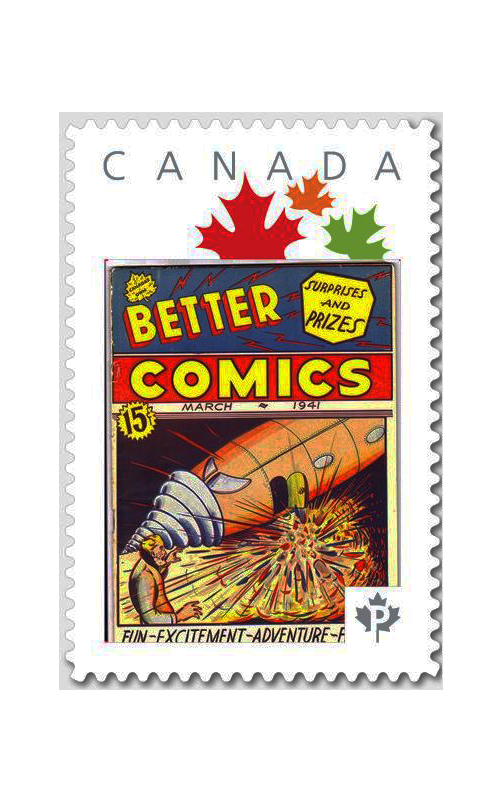 This Saturday I’m at the Montreal Comic Con giving a presentation on my book on the Bell Features artists and the special guest at the presentation will be original Bell Features artist Jack Tremblay who turned 91 this past May. Montreal-based Jack Tremblay’s main work for Bell concerned the adventures of Air Ace Crash Carson in Wow Comics issues 8-16. Jack also did a short run called “Wings over the Atlantic” in Commando Comics 1-3. 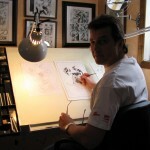 After his short time in comic books, Jack Tremblay became a successful graphic artist and eventually a well-known fine artist. 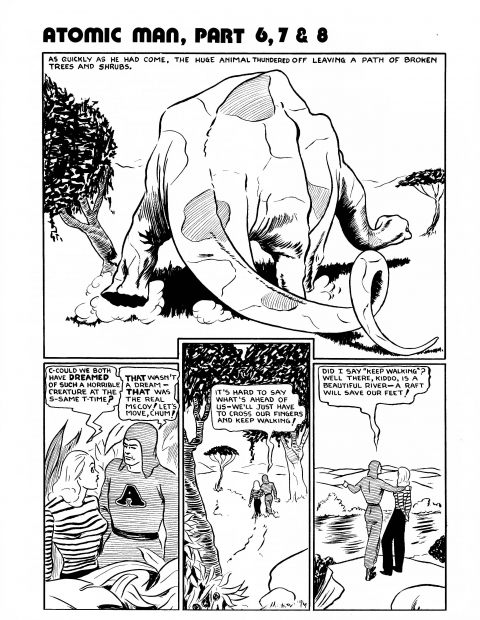 In 2014, Jack Tremblay issued a 100-run independent comic called Esthetic Comics that conveys some of his views on the artistic enterprise. 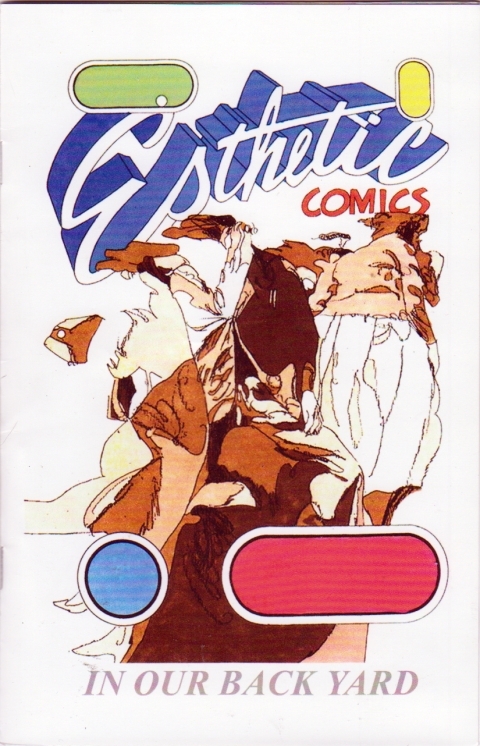 Jack Tremblay’s 2014 Esthetic Comics. The presentation will be in Rm. 514 at the Palais de Congrès at 4pm on Saturday July 8 and after a short summary of what WECA comics are and what my book is about I’ll devote most of my presentation to Jack so that he can talk about his experiences. Jack Tremblay will also do a signing for about an hour at the ICE Exchange/Big B Booth just after the presentation. 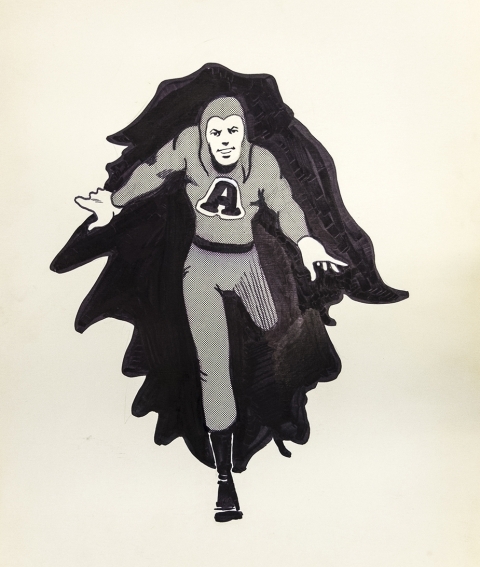 I’ll also give away a few packets of the Canadian superhero cards that were available at last Spring’s Alter Ego Exhibit at the Library and Archives of Canada. I hope those readers who will be at the Con will have a chance to drop by, here what Jack has to say and maybe ask some questions. 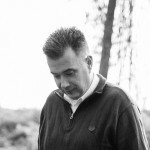 I would be great to meet up with any and all of you. Hi Ivan, another good post here, thanks for bringing it to us. In the time since the original mention of Real Boy’s Stories more research has shown that there was another Classic Pub. Co. around Toronto at this time. They published magazines like Real Crime Cases and I’m now of the opinion that this operation, at 7 Adelaide St., is more likely the publisher and not anything to do with Gilberton at all. 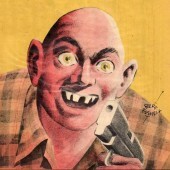 You can see a sample cover of the pulp magazine at the Will Straw website here: https://goo.gl/8n9EDG . 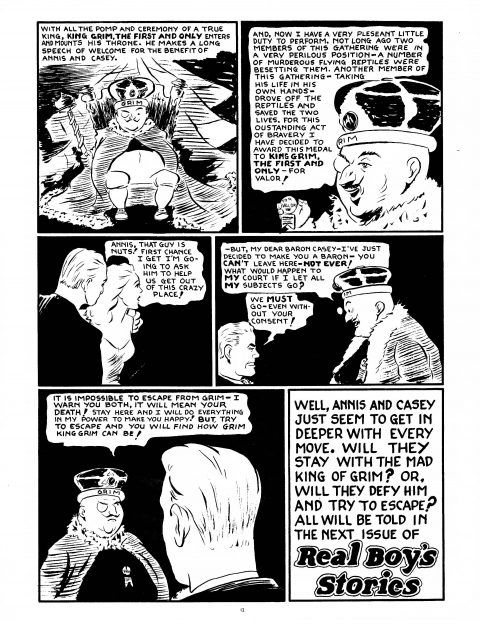 Hopefully we can unearth the second issue of Real Boy’s Stories at sometime and find out more. The only hope for historians to find out more about this book is if the buyer is dedicated enough to its cultural significance to crack that damned seal, the bane of every comic historian. CGC is the absolute worst thing that ever happened in terms of limiting our knowledge of these great old books. If the only people buying them are the speculeeches looking to turn around a quick buck, we will never know the contents of some of these books buried for all time in plastic coffins. I wish I could be more optimistic, but I really see this as a hindrance to our understanding of our own cultural history more than anything. But…money talks, and it usually only talks to people with “professionally graded” books. I’m with you there Mel. Speculeeches! I love it. Neither a comics reader nor a collector, just a junk bond dealer that can’t figure out the stock market. “Just a junk bond dealer that can’t figure out the stock market.” Perfect definition of the speculeech. The only CGC graded books I have are three “qualified grades” with pages missing but lovely covers that are still graded as high as an 8.5 in one case.I picked these up as prime examples of what is wrong with CGC for twenty bucks a piece after a local dealer sent them off to grade without even checking the interior. That’s a lot of money to pay to have some idiot tell you that a book which most people would consider damaged is actually worth money because it looks good on the outside.Where do these people get the gall to attest to such a thing? 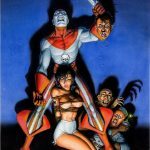 It is heavily flawed and should be graded as such, but CGC, in their supposed wisdom as the arbiter of what is valuable and what is not, have decided it’s still worth significant money. Hefferdust! Let’s call a spade a spade and have done with these poseurs. Thanks Jim and Mel for contributing your comments. Jim, I hope that we can all eventually solve this mystery and some others before these books and the people behind them drift off into obscurity and maybe oblivion. Mel, I sheepishly admit I’ve gotten a bunch of my WECA books slabbed, but only after I’ve digitized their contents. I’m in a retirement financial position where I eventually will have to sell my collection and can’t afford to donate them to an archive and the best results are sadly obtained through those plastic coffins. Well, you’re certainly right that slabbed books will net you a better return at resale. As you say, “the best results are sadly obtained through those plastic coffins.” Heavy emphasis on the word “sadly.” And, sadly, upon retirement we none of us have unlimited funds and have to get by as best we can. I think the big guns in it for purely speculative reasons were the actual target of my tirade.